The Windsor-Essex Community Opioid and Substance Strategy Leadership Committee has released an online report that outlines key accomplishments that took place in 2018 after a full year of strategy implementation. The report was launched in conjunction with the new website. Following the release of the action plan in January 2018, the committee and working groups identified a number of important activities to address in year one. The activities fell under the four broad themes of prevention & education, harm reduction, treatment & recovery, and enforcement & justice, which are described in detail on the new website. “Much progress has been made to date, but we must continue our efforts to implement our community action plan and develop strategies that will address this complex issue,” said Windsor Mayor Drew Dilkens. Those behind the strategy recognize programs may not have an immediate impact on the annual overdose death rate. 28 people died in the first nine months of 2018 from apparent opioid overdoses, which Medical Officer of Health Dr. Wajid Ahmed said is in line with rates from the previous two years. Data from Public Health Ontario shows 36 opioid-related deaths in Windsor-Essex in 2017. That compares to 37 in 2016 and 24 in 2015. Some highlights from 2018 captured in an infographic include the development of an overdose monitoring system, which tracks overdose events in the community and improves the communication between hospitals, emergency services, and community partners. A second highlight was the installation of seven new needle disposal bins, which have collected 35,478 used needles to date. Another enhanced harm reduction program was the distribution of 3,679 naloxone kits to community members. 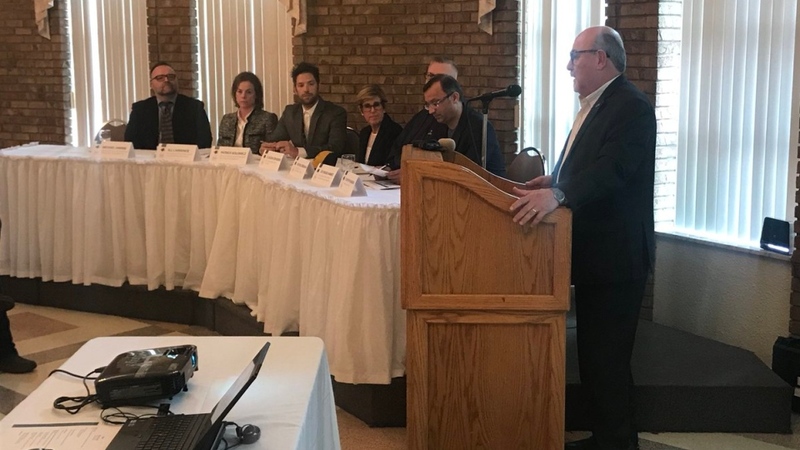 “Thank you to all participants of the leadership committee who continue to work diligently to develop a comprehensive strategy to address this complex issue,” said County of Essex Warden Gary McNamara. McNamara added it is going to take the continued collaboration of all involved parties, including the provincial government, to devise an approach that will address the needs of everyone affected by substance use. Officials outlined the greatest highlight of 2018 was the 28 community agencies coming together to address key substance use issues in Windsor and Essex County. "I'm seeing greater addressing of stigmitization with this population," said Michael Brennan, the Executive Director of the AIDS Committee of Windsor. "But the road is still long and there's going to be a lot of work ahead of us."